Harvest Expeditions has touched many lives since we first started in 2008. Here are just some of the many ways we are blessed to be able to have helped others. Harvest Expeditions has facilitated numerous missions trips for many types of groups such as men's groups, ladies only groups, kids and youth groups, and teachers and professionals groups. We have hosted dozens of short term missions teams as well as enjoy regular day visits from teams passing through our area. We consider it one of our biggest strengths that we can prepare teams and leaders for the missions field. We love to mentor interns for short or long term stays on the mission field. So far we have had 15 long term interns with us whose impact has made a huge difference in the lives of our kids with daily care. We are delighted to see a long term impact on our kids. To date one child has been adopted, and three more adoptions are scheduled to finalize this Spring. Five other children are in long term foster care with local Belizean families in our area. We've had several children that were reunited with their families. Three of our children are currently in High School and their future is looking bright! In 2009 Harvest Expeditions youth team dug post holes and put up 500' of fence line for a children's home under construction in the Cayo District of Belize. 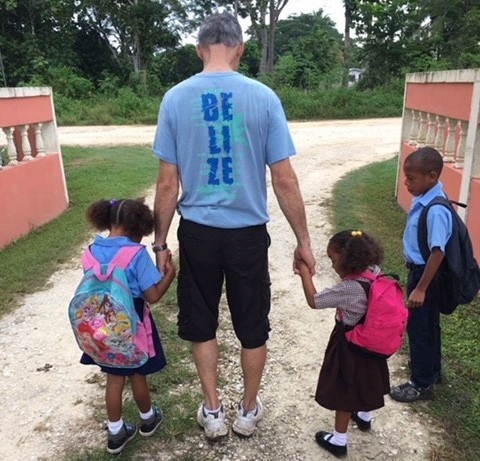 2010-2015 With an emphasis on local schools in Belize, Harvest Expeditions has retrofitted two different playgrounds, a basketball court and classrooms with upgrades. HE has been generous with providing sports equipment and school supplies as well as providing medicine and clothing to those in need in the community. Working side by side in local preschools, we taught dental hygiene to several hundred students and distributed hundreds of pounds of school supplies. Between 2014-2015 we worked with Gonzales School of Education in Ghana, Africa and built a dining hall, a kitchen and an 8 stall bathroom with shower. We brought several hundred pounds of various school supplies to the 270 children that attend the impoverished school. Harvest Expeditions hosted a medical and eye clinic in Ghana serving over 500 people from the surrounding villages. In 2016 Harvest Expeditions responded to Hurricane Earl with food and clothing distribution for affected villages in Belize, Central America. Team members rallied to raise 175 backpacks and over 1000 pounds of clothing for distribution.